Part two focuses on the “Foundations of the faith.” Zaspel notes, and evidences, that while Warfield is most known today for his defense of Scripture, he wrote on the whole range of theological topics. He had a theological acumen on nearly every issue in Biblical studies, says, Zaspel. This becomes evident as chapters 3-8 dive into the core doctrines of the faith: authority of Scripture, redemption, justification, conversion, the Holy Spirit, and sanctification. 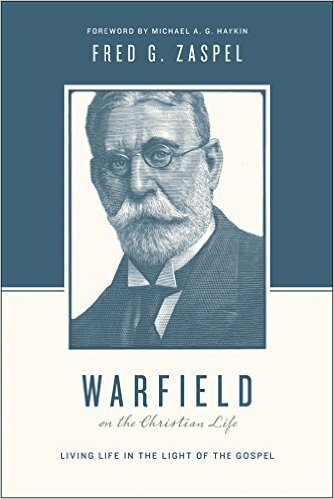 In each chapter readers not only get a glimpse of the brilliance of Warfield’s conservative orthodoxy, but they see how each doctrine connects vitally to their Christian life. Theology is the heart of Christian living. The gospel is entirely practical and relevant to our day-to-day living. It is the heart of the Christian life. This great theologians invites us to live in light of the gospel. Part three directs our attention to what Zaspel calls “Orientation and Perspective.” Here readers are introduced to some of the more particularly existential aspects of the Christian life. Of particular love is Warfield’s chapter on divine providence, which aim to give much hope to those in suffering. Again, Warfield demonstrates the practicality of theology. Part four concludes the divisions of the book by exploring our “living response” to this gospel message. In some sense readers will see the familiar themes of the spiritual disciplines addressed in chapters 12-19. His chapter on the religious life was particularly insightful as so few writers attempt to address such a meta topic. Warfield does so beautifully and always with an eye toward the Christian’s living response to revelation.